I hope that you all love peaches as much as me, because I have no less than 4 peachy recipes to share in the coming weeks. Some are savory, some are sweet.. but they are all pretty awesome! Peaches are by far my favorite summer fruit, so I definitely take advantage and cook with them as often as possible while they're in season. I know that tilapia gets kind of a bad reputation, but I actually think it's a great fish. As far as farmed fish goes, it is one of the most sustainable choices out there - though buying US caught tilapia is a better choice than going foreign. Plus, it is very mild, cooks quickly, is very affordable, and can be combined with so many other flavors to create tons of different flavor profiles. This recipe is one of my new favorites. You make an easy marinade from fresh peaches, garlic, and herbs, and marinate the fish for up to several hours. Each piece of fish is then wrapped in a foil packet and grilled (or baked). Super low maintenance, and super tasty and healthy. I really love pairing fruit with fish, so this was an especially awesome dinner for me. The herbs and garlic help to keep the peaches from overpowering the delicate fish, but there is still plenty of peachy goodness to enjoy. And speaking from experience, it is also a very forgiving dish. My grill ran out of propane as I cooked this, so I had to transfer it to the oven to finish cooking. I ended up overcooking the fish just a tad, but it still tasted great, and the foil packets really help to keep the moisture in. I served this with an incredibly awesome rice dish that I'll be sharing in the next few weeks, along with some grilled (umm and then broiled when the propane ran out) zucchini. It was an awesome summer dinner that I can't wait to enjoy again before peach season is over! Combine all the ingredients through the pepper in a food processor, and blend until the mixture is combined and smooth. Line a medium baking dish with the fish (or use a large ziploc bag), and pour the marinade over it. Turn the fish a few times to coat well, then cover and refrigerate at least 1 hour, or up to 14 hours. Prepare grill by preheating to medium-high heat. Lay out 4 14-inch lengths of foil, and arrange a few onion slices in the center of each one. Using tongs, transfer 1 piece of fish to each piece of foil, then spoon a little marinade over the tops. Fold the foil over the fish, folding the edges to seal. Grill 10-12 minutes, or until the fish is cooked through and flakes easily with a fork. Alternatively, cook in the oven at 425 degrees for 12-15 minutes. Carefully open the packets to serve. It looks so good. 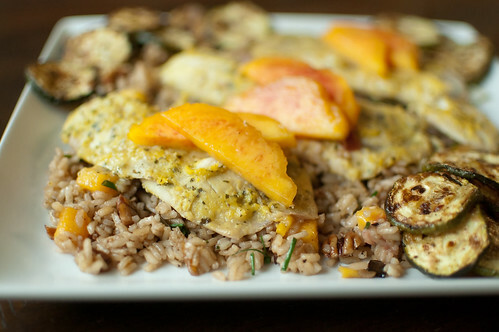 I've always wanted to try a savory dish with peaches. i saw this the other day on "how sweet it is" and printed it out to try as well. it looks so amazing, i'm glad to hear you liked it as well!! I don't understand why tilapia has such a bad rap. I grew up loving it, but recently did start hearing about so many people who won't use it. I love this idea, I'll be trying it soon. Thanks for sharing. I have never thought of peach with fish. 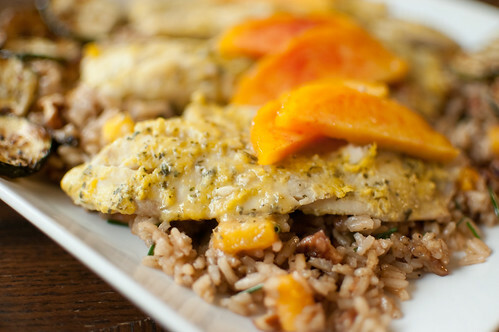 But then again, I could see where the peaches would add a wonderful sweetness to the tilapia. Thanks. I like the sound of the peach and fish combo!